I really want to go to the desert and ride camels, but I don�t want to do a touristy group trip. Oh Madame, my family live in desert. You can stay with them, ride camels. I was sitting on the rooftop restaurant of my guesthouse sipping spicy milk tea and chatting with my waiter. 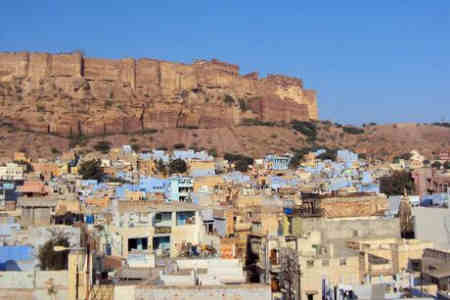 Looking out from the terrace, the mighty Meherangarh Fort rose above craggy cliffs beyond the pale Brahmin-blue houses of Jodhpur. One hour later I was on a state bus to Osian, where I was to be picked up by my waiter’s older brother in a jeep. Next to me in the rattletrap, peanut-shell-littered bus were two girls with large ornate nose rings attached to their left ear. One was dressed head-to-foot in a scarlet sari, the other in marigold-orange. The man in front of us, with cheeks puffed out like a chipmunk, intermittently leaned out the window to spit red pan juice. At the Osian stop, I peered through the filthy window and saw two men standing in front of a jeep. I pushed my way out of the bus. “Yes,” I smiled looking into the amber eyes of one of the handsomest men I had ever seen. His eyelashes were thick and long as a camel’s; his cheekbones high and strong with a square jaw and full lips. He was dressed in a thin, narrow-lapelled, polyester gray suit with no pockets; his bare feet slipped into plastic loafers. A small hole gaped from his left trouser leg. Not exactly the desert-robed image I had anticipated. But that was only the first of non-expected events. I got in the back seat of the jeep. Nansuk sat in the passenger seat and Rajesh drove. Rajesh was slight and dark as a blackbird, and could barely see above the steering wheel. The jeep wound its way out of the small town and was quickly plowing its wheels over the tawny sands of the Thar Desert. “There is wedding tonight.” Nansuk twisted around to face me. “Americans are getting married?” That wasn’t at all the ethnicity of bride and groom I had envisioned. The night before, at their guesthouse in Jodhpur, John and Emily of Portland, Oregon had mentioned to Yogi, the guesthouse owner, how romantic it would be to get married in the desert. Less than twenty-four hours later, Yogi, had arranged everything. The landscape turned bi-colored: the sand-tan of the earth, and the electric-blue of the sky. Knobby branches of leafless trees cast their shadows in the pale sand. Strange shale-sided, thatch-roofed huts dotted the landscape, squat and pink. Herds of goats balanced against tree trunks on two feet, nibbling at the last remaining leaves of branches. I had the afternoon to wander over the ever-deepening rose hues of the sands as the sun sank, a huge crimson ball balancing on a far off dune. Goats capered about everywhere, horned cattle ambled, tethered camels stood in stoic patience, their jaws circling, and an occasional tawny antelope or two bounded across the sands. Meanwhile there was great activity around the huts. Turbaned men and boys with mufflers tied around their heads put up a large tent then erected two pillars with a bar across the top and hung lights. A generator was pulled out and many electric extension cords were attached. Women in bright red saris carried water from the well, collected firewood and dried cow dung patties from the thickets beyond the first dune, and hustled about the kitchen preparing food. Aromas of ginger, garlic, turmeric, cinnamon, cloves, nutmeg, cardamom, cumin, and black pepper sizzling in hot mustard oil filled the courtyard. The mother, dressed in a bright green sari with a long red scarf pulled over her head, “kee kee keed” to the goats and shepherded them into a hut made of thorned thicket branches. Noticing me looking at her, she beckoned to me to join her. 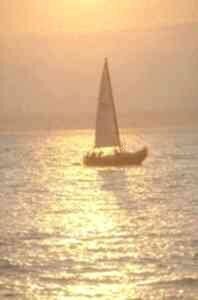 I tromped my way up the silken sand and she indicated I should come into the hut with her. She squatted, placed a pail below the udders of one goat, and with practiced dexterity drew milk in long streams. With sign language (she spoke no English); she offered me a turn at the milking. As a city girl from Philadelphia, Pennsylvania, milking goats was not part of my education. I squatted, grabbed the udders the way she had and attempted to do as she did. Nothing. I tried and tried, then moved aside. She took two udders in her calloused hands, stroked them, then pulled. Milk gushed into the pail. Again I tried and after a few more awkward attempts, finally managed to extract a miserable drizzle of milk. With a wedding party soon to arrive, the mother took over, smiling a bit pityingly at me. I could only imagine what she must have thought. How does this poor woman survive in life, if she can’t even milk a goat? With the setting of the sun, the desert air quickly grew chill. In the twilight people continued to scuttle about everywhere making preparations. Three boys twisted six-meter long swaths of red fabric into turbans. Young girls swept the sand from the crest of the hill to the main hut with tree branches tied together with rope. Musicians and dancers arrived, the women dressed in brightly-coloured mirrored skirts, the men in marigold-orange turbans. Finally the headlights of several jeeps appeared in the darkness: one carrying the bride, her best friend, and two other women staying at the same guesthouse; one bringing the groom, his best friend, and several men from the guesthouse. Local desert people arrived on camels, horses, and motorbikes. The bride was quickly secreted away and sequestered in one hut as a troop of women went about transforming her into a Rajasthani bride. The groom was taken up and over the crest to the tiny village nestled on the other side where he was subjected to his own transformation process. By now, the sky had grown black. A switch was pushed, the generator jolted into operation and the dark desert was alive with party lights hung everywhere. At nine, the musicians beat their drums and blew their horns. The women waggled their tongues and wailed in the traditional ululation. A chorus of nine women took up a chant. 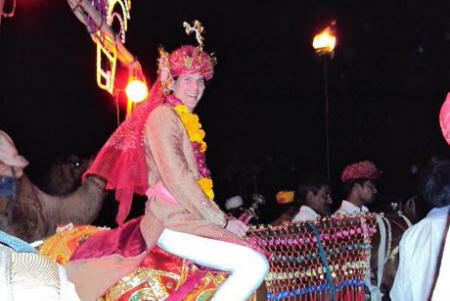 The groom, bedecked with feathered turban and swathed in scarlet Rajasthani garb, was pitched up onto a white, jewel-bedecked horse. The dancers swirled their hips, their mirrored skirts flitting reflected light everywhere. Firecrackers were popped and blasted. Everyone clapped their hands in time to the percussion as we all paraded alongside John on his white horse. When the procession crested the sand dune, John was directed to pause under the lit post. The musicians’ music built to a crescendo. As I frolicked along twirling my hips, the locals pushed me forward to join the dancers in the middle of a circle as I watched and imitated their moves to the delight of everyone. The chanter’s song reached its climax, the women wailed, and John passed through the goalpost and headed down the hill toward his waiting bride. Meanwhile, Emily’s hands had been covered with Mendhi, the traditional Indian henna designs. She was draped in a scarlet dress with gold decorations dangling on her forehead and around her neck. John dismounted and he and Emily were guided into the inner courtyard of the main house where a mandala had been drawn in the center of the mud floor. Rose and marigold petals were sprinkled everywhere. They were seated on a wooden bench by the small fire that burned in the center of the mandala. Their hands were bound together in blue cloth as a holy man chanted and dropped herbs into the fire. The flames spurted, as the chorus of women chanted and the holy man sang verses of desert marriage vows. Then John and Emily were instructed to stand and circle the fire seven times. The women ululated, everyone cheered and John and Emily were married. Wicker mats were laid on the mud floor and everyone sat for the wedding feast. Tub after tub of Rajasthani dishes were ladled into our aluminum plates. With only our hands, we ate native style, squishing the rice into balls and pushing it into our mouths or using pieces of chapatti to scoop the vegetables. After the meal we all tottered contentedly outside where a roaring fire blazed in front of one hut. The musicians began to play and the dancers swung their hips and circled their hands. The lead dancer placed one pot atop her head and sashayed around the cement platform in front of the hut. Then she placed a second pot atop the first and continued. Five more pots were piled on her head, one nestled into the other, and after each addition she pranced about, shook her hips and twirled. After the seventh pot was placed atop the rest, another woman set a metal plate on the floor. The pot-laden dancer gingerly placed one bare foot on the rim, then balanced and set her other foot on the other rim and proceeded to swivel her way around the entire circumference of the platform still balancing the pots on her head. Then a wooden block with about fifty long nails protruding from it was placed on the ground. The dancer stepped off her plate, onto the bed of nails and danced away. A huge outburst of applause, whistles, and whoops erupted from the guests. Finally John and Emily were escorted up onto the platform as the musicians pounded their drums and blew their horns. They danced their first dance as desert man and wife. At around midnight the bride and groom and their guests from the pension all piled back into jeeps and disappeared over the crest of the dunes. Other wedding guests departed on motorbikes, camels, horses and jeeps. The generator was turned off. The desert turned black and silent. Nansuk asked if I would sleep inside the hut opposite the main house, but despite the cold, I wanted to lie under the desert stars. He pulled a charpoy (the traditional Indian bed of knotted rope) out of the hut, laid a thin mattress atop it, and heaped a mass of quilts on top. I nestled under the mountain of quilts with all my clothes on and gazed up at the best light show in the world. A zillion stars shimmered and shimmied. Satellites—tiny pinpoints of light—traced their orbs. Orion struck a hunter’s stance, Cassiopeia rocked in her chair and shooting stars streaked across the glimmering heavens. I fell asleep smiling, knowing tomorrow I would ride Moti, the multi-coloured-pom-pommed camel, across the desert sands. Many more adventures awaited me. If you enjoyed reading the above article then you will probably also enjoy Shanghai, also in Asia, and our latest articles covering the Orinoco Delta, La Mata, Marbella and Beijing.